Scottie Lindsey dribbles the ball. The sophomore guard played 25 minutes against Purdue but only shot 1-of-6. With under 9 minutes remaining in Tuesday’s road contest against Purdue, the Wildcats’ first player fouled out. It was freshman center Dererk Pardon, who, in just 6 minutes of playing time, picked up five fouls as he struggled to contain Purdue’s interior wrecking crew. He wasn’t alone, though: The entire frontcourt struggled to keep the Boilermakers’ physicality in check. And behind a 21-5 disparity in makes from the free throw line, Purdue took advantage of an NU squad with no answer along the defensive interior, winning 71-61. In the end, senior center Alex Olah, sophomore forward Gavin Skelly and freshman forward Aaron Falzon all fell one foul shy of sharing Pardon’s fate. Graduate transfer center Joey van Zegeren and junior forward Sanjay Lumpkin both notched three fouls, as did sophomore guard Bryant McIntosh from the backcourt. Collectively, the team’s foul trouble did more than simply award the Boilermakers opportunities from the charity stripe. Spending the game on the fringe of fouling out prevented NU’s bigs from bringing the intensity necessary to oppose a Purdue interior crew that included senior center A.J. Hammons, freshman forward Caleb Swanigan and sophomore center Isaac Haas. 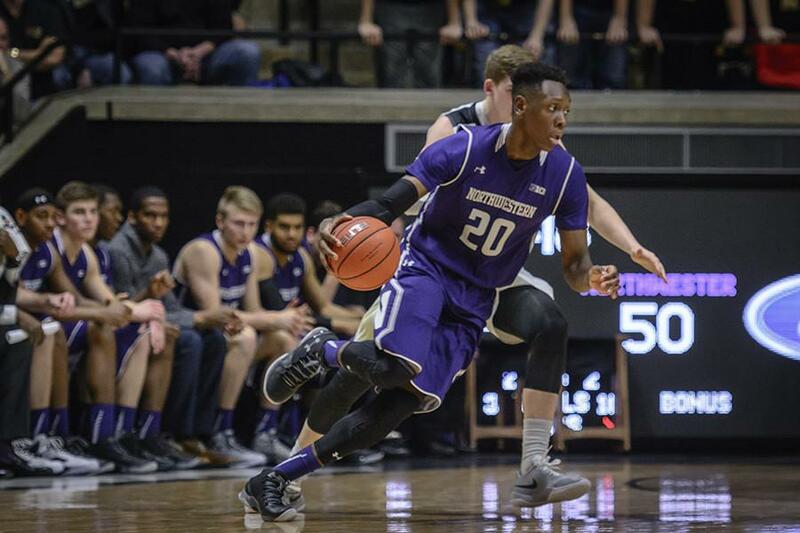 Only Pardon seemed unhampered by the threat of fouling out — not that it helped NU. From start to finish, the Boilermakers worked the ball into the post where the 7-foot Hammons — who alone finished 8-of-11 from the free throw line — or another Purdue big would bully an NU defender into either fouling or allowing an effortless attempt from down low. Even when the Cats found themselves forcing the Boilermakers into a series of mid-range jumpers to start the second half, Purdue compensated for its inability to hit a field goal — it went 8-plus minutes without one — by routinely getting to the free throw line. And when the defense relaxed, with Olah, Skelly and company looking to avoid joining Pardon on the bench, the Boilermakers’ frontcourt seized the opportunity as well. That NU didn’t share the effort spent getting to the stripe further doomed it in this contest of sheer physicality. Though they ultimately found an offensive groove out of the pick-and-roll set, the Cats played a relatively cautious offensive game — jumping at the opportunity to take open shots and only driving to the rim when a Purdue big was drawn out of the paint. Ultimately, there was little NU could do. Against Purdue’s size, a Cats team with limited interior options and a penchant for small ball was simply outmatched.